We woke this morning to find four inches of fresh snow covering the red cliffs, and forty-nine elk standing on the mountain slope in front of the house. We made coffee and sat in front of the window to watch them peacefully graze down the mountain to the creek below. As we did, we could hear the buffalo calling to each other in the meadow. They love cool spring mornings best of all. There’s new green grass, but no biting flies yet. Hope you have a peaceful and perfect day! The largest “Lost City” in the world is in the United States. It’s called Cahokia. It was a huge metroplex that lasted nearly three hundred years. Today what remains of the city is scattered throughout—and under–the sprawl of St Louis and lies on both sides of the Mississippi River. This isn’t our first novel about Cahokia. We’ve been fascinated by this ancient city for three decades. We started writing about it in PEOPLE OF THE RIVER. And, as new research poured in, finally wrote PEOPLE OF THE MORNING STAR. 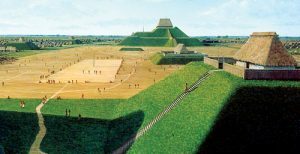 Cahokia–a city that would have swallowed its eleventh century competitors, London, Paris, and Rome—is mysterious and mesmerizing. Today it consists of large mounds of earth. But these are just the foundations, as if New York City were scrapped away by a giant bulldozer. What made Cahokia into one of the largest cities in the world? What brought tens of thousands of people streaming into the central Mississippi Valley to build the magnificent mounds, causeways, and stunning five-story temples? Archaeologists suspect it was religion, specifically a messiah figure called “Morning Star.” The renown of a living god would have traveled up and down the rivers, word of his coming carried across mountains and down the trails by traders. And the people came, settling in the living god’s proximity in one of the most fertile agricultural valleys in the world. We also suspect word might have eventually reached Mayan traders who plied the Gulf waters and sailed out into the Carribean. Which begs the question: What would the Itza Maya in Chichen Itza have made of the story of a resurrected god? Especially since it cleaves so closely to the Maya’s own stories of the resurrected heroes from the beginning times. 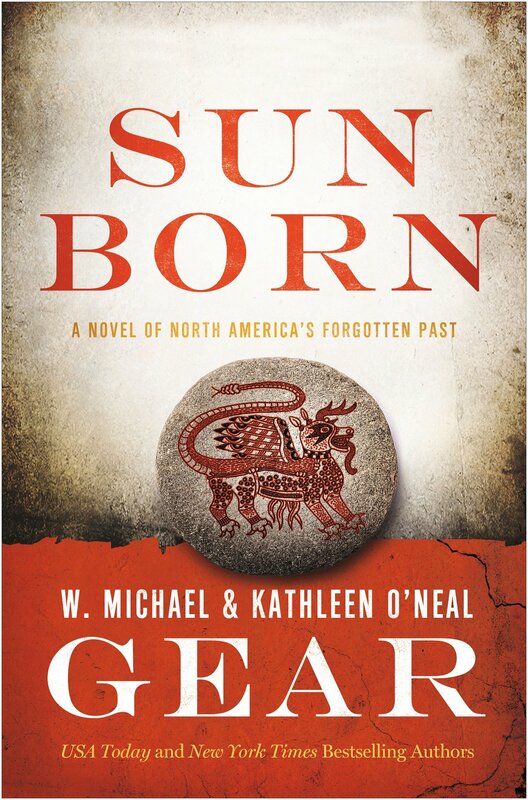 In SUN BORN we provide a possible answer, one compatible with the tantalizing bits and pieces in the archaeological record. With SUN BORN the story of Seven Skull Shield, Clan Keeper Blue Heron, the truculent Fire Cat, and Lady Night Shadow Star continues. But this time, the Itza lord, Thirteen Sacred Jaguar is coming, and he has a secret. One that has the power to topple Cahokia, and ruin the lives of its most beloved citizens. Truly, Cahokia was one of the magnificent cities of the prehistoric world. 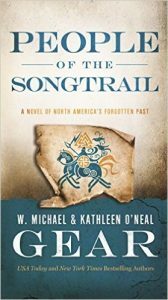 We hope you enjoy this story about ancient America. We’ve been writing bestselling novels about the past for almost thirty years and are often asked how we create a doorway that allows a reader to follow our characters into the glacial world of a novel set 10,000 or 20,000 years ago? Honestly, it’s all about research. But not necessarily “book” research. First of all, we are both professional archaeologists, so we actually excavate sites that date to the Pleistocene Ice Age. But writing well about peoples that lived thousands of years ago is less about people than it is about their environment. After all, human beings are pretty much human beings. We all feel love and despair, and strive to feed and protect our families. That has been true for at least 200,000 years, since the dawn of modern humans, but those same emotions probably existed long, long before that among our archaic human ancestors. The key to writing well about the past, for us, is to understand their world. What were the animals, the plants, the threats they faced? How did they survive in what, by modern standards, was a very hostile world? The writer has to able to LIVE in that ancient world. If a writer isn’t actually walking through that world in his or her mind, a reader will feel what President Theodore Roosevelt once called “nature fakery.” He accused Jack London of this after reading Call of the Wild, by the way, which was certainly an unjust accusation, at least so far as we are concerned. How do we avoid ‘nature fakery?’ For us, it begins with the archaeology. We set the scene with scientific facts. We analyze the ancient pollens and tiny silicate skeletons of plant cells (phytoliths) that we find in sites to know what was growing there at the time. Then we fill the scene with the animals that roamed that countryside: Bison priscus, mammoths, dire wolves, American lions, and short-faced bears, among others. Geology is critical. What did the glaciers look like? If you were paddling down the coast of British Columbia, heading for Washington, 20,000 years ago, how tall were the ice mountains? How far did the ice extend into the ocean? Once we’ve set the scene, then we have to get serious and try to start seeing through the eyes of the characters. For example, one of the most important daily activities of prehistoric peoples was finding food. How do we make a prehistoric hunt feel real? Ah, now the story becomes a lot more than book-learning. What inspires a writer to write convincingly depends entirely upon the the writer. In our case, it goes to the heart of our own lives. Just last week, for example, we were working on a archaeological site in Wyoming that dates to around 13,000 years ago, when we came across a Clovis point resting in the midst of ancient bison bones. The Clovis people were brilliant big game hunters. When we pull the beautiful red spear point from the ribs of the bison, magic happens. As we turn the point in our hands, we are suddenly transported back to the hunt. In our minds, we see where the rest of the clan must have been positioned, hiding behind rocks and below the crests of hills, ready to cast their spears. 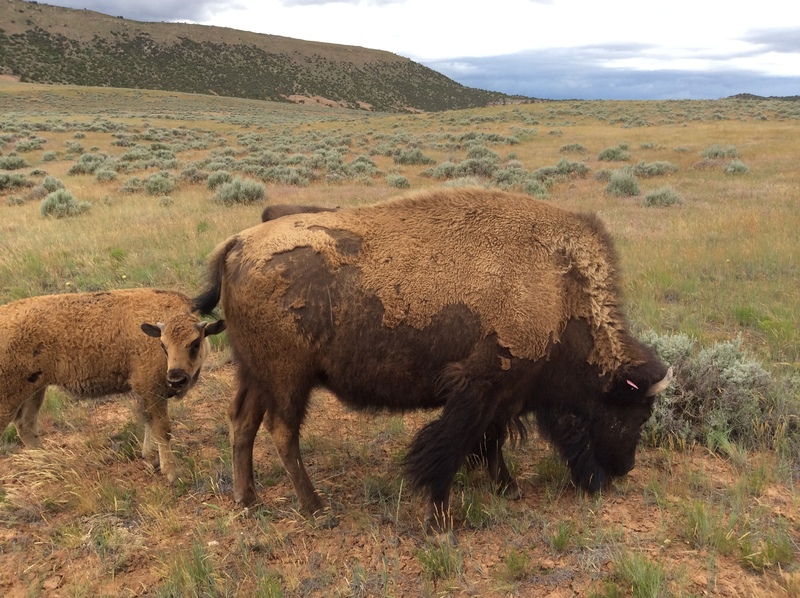 For a few moments, we imagine how the bison herd slowly grazed down the valley into the trap. And we know the bison would not have done so if the wind had been wrong. They would have smelled the hunters and bolted for the high country. So the hunters made sure the wind was blowing in their faces as the bison came down the trail. 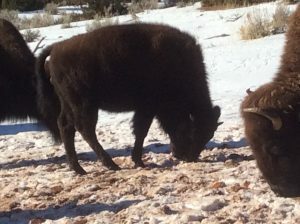 Bison are extremely intelligent and cautious wild animals, with excellent vision. If the animals had sensed anything was wrong, seen a curious shape in the brush, or the slightest movement, the clan would have gone hungry that night. How do we know that? We live with bison and watch them as much as they watch us (on Twitter use hashtags: #RedCanyonRanch and #CleopatraTheBison to see videos and photos of our daily lives). The smallest nuances of behavior, the way their eyes bulge when they suddenly spot something incongruous in the landscape, become part of our storytelling. We can tell you that the decision-makers in the herd are the lead cows. If the herd bolts, it will be because those smart old cows sensed something was amiss. Prehistoric peoples, of course, knew this, too. They would have been watching the lead cows closely. Even if the herd was not in optimal position, if one old cow had lifted her nose, scented the wind, and taken a step backward, the clan would have probably sprung their trap, knowing they had to cast immediately, because seconds later the herd was going to be gone. Avoiding ‘nature fakery,’ then, is all about knowledge and experience–just as it was for Jack London. Could London have written Call of the Wild if he had not been in Alaska? Probably, if he’d done his research. After all, Ben Bova and Ray Bradbury didn’t have to go to Mars to write beautifully about it. But we can pretty much guarantee you that if they had gone to Mars you would feel it in your bones when you read their stories. An author’s life experiences provide a sensual texture to their stories that allow readers to use their written words as stepping stones for self-transcendence. In our stories, those stepping stones lead readers through the doorway and into the misty iced past where they can clearly hear dire wolves howling in the distance as the bison herd thunders down the hill in front of them. What do you think about ‘nature fakery?’ Let us know. Autumn in northern Wyoming is so peaceful. It’s a beautiful cool morning here, 46 degrees. Our chestnuts and aspens started to turn color a few days ago and are now shading red and gold. The buffalo love this time of year, as well. 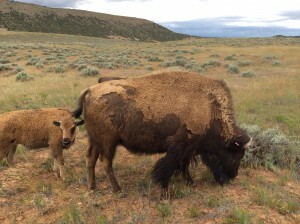 The biting flies begin to disappear, and the calves are big enough–300-400 pounds now–that they can pretty much take care of themselves against the mountain lions, wolves, and occasional bear that comes through. We love this time of year. Thanks to everyone who wrote to say how much they like the new PEOPLE OF THE SONGTRAIL cover and style. We agree. We’re really delighted with the new look. 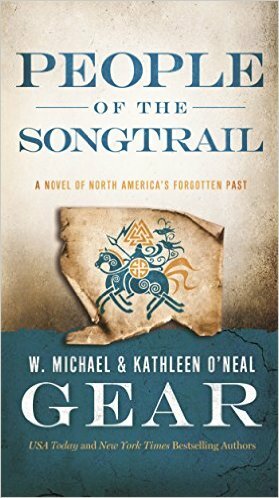 And it was so much fun to write about early Vikings in North America. SUN BORN, The second book in the PEOPLE OF THE MORNING STAR series, is due to be released in about a month. We really hope you enjoy it. Cahokia at it’s peak was truly an amazing city. We wish you all a happy and serene Autumn.